Originally, I thought I would write a nice little post about shipping via the US Postal Service. What to do, what not to do. Then I realized, there is quite a lot of information to share, and it is too much for one sitting. 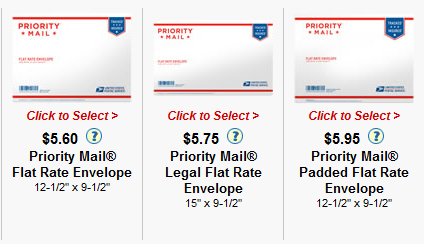 Today we are going to talk about the USPS Flat Rate Envelope, or FRE. It sounds like a simple thing, until you realize there is more than ONE FRE! There are actually three different mailers that are all variations of the FRE. First is the original – THE Flat Rate Envelope. For years, this was the only option for FRE mailing. I have stuffed all kinds of things in these over the years – yards of fabric, items of clothing, packs of snaps, patterns, lots of things that USPS probably never intended these envelopes to be used for. 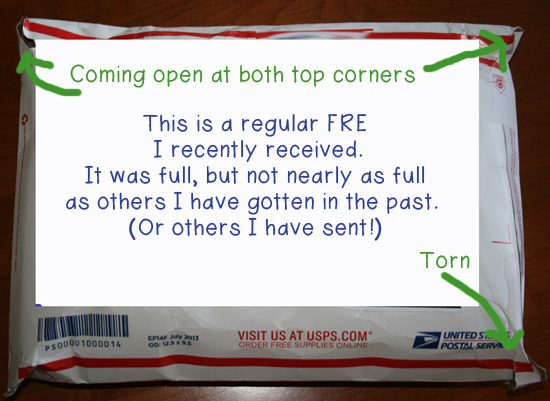 But, when they first came out, the single rule was that whatever was in there had to fit in such a way that the closure flap could meet in the proper place on the front of the envelope to close. If you wanted to put half a roll of tape on it to reinforce the corners or keep the whole thing from bursting, no one at my post office complained. Next came the LEGAL size FRE. It seems that people actually did use the original FREs for their intended purpose of shipping documents quickly. 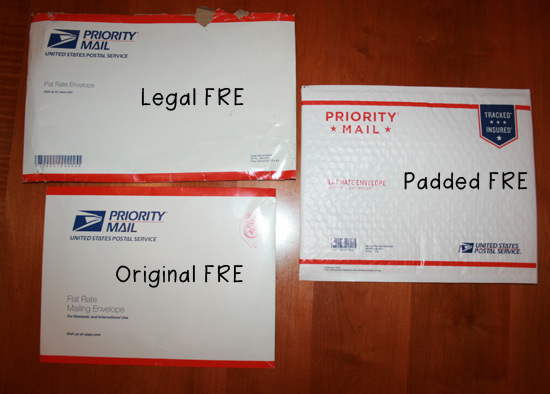 Those sending legal contracts or other oversized pages had a need for a slightly larger envelope to accommodate those things, so the legal size FREs were introduced, with a slightly higher shipping cost. For those of us using the original FREs for other things (like fabric! ), these legal size envelopes offered a little more room. But, these paperboard mailers were not really meant for fabric. Sure, we got it in there, but often the envelopes would arrive torn and sometimes their contents would get dirty or even damaged as a result. Here is a FRE I received recently. It did not even travel terribly far. The machines used to process the mailers were expecting them to be flat. When they weren’t, things did not always end well. The solution: the PADDED FRE. The padded FRE, or PFRE as it is commonly known, arrived to accommodate all those odd shaped things we had been previously shoving into the original FREs. When they first came out, they had a papery outer and bubble mailer inner. The latest version has a more plastic-y polymailer type outer and bubble mailer inner. They are much more durable than the paper coated outer was. 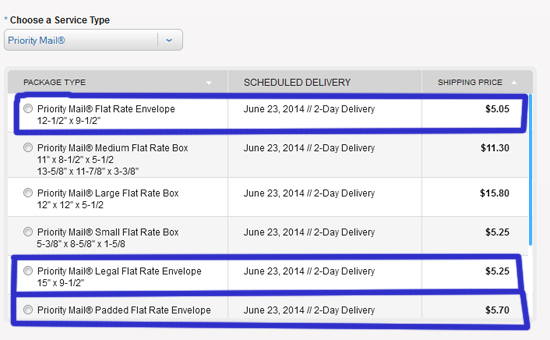 Even though they are all Flat Rate Envelopes, the rate is not the same. The original FRE is the least expensive, currently shipping for $5.60 to any US destination from your local post office. The others cost more. And, if you are shipping through PayPal (but not for an eBay purchase), only the original FRE option is available there. It would be easier to print these labels from PayPal. Some people have said that you can print from PayPal using the FRE option and then add on stamps to make up the difference. 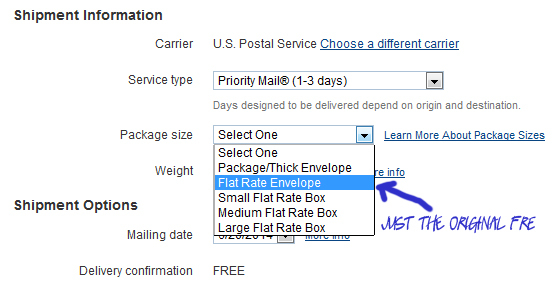 Since I rarely have stamps, let alone the exact amount I would need, I ship through USPS’s website. When shipping through USPS, you can still pay with PayPal, so that is nice. Sometimes I hear comments that they should all be the same rate. And of course, those folks usually want the rate to be the cheapest rate. (Who wouldn’t!) But, it makes sense that the padded mailers have a higher shipping charge because they are a more expensive product to produce. The paperboard mailers work fine for their original purpose of shipping documents. But even the current version of the original FRE seems to be more flimsy than the original paperboard that was used when the FREs first came out. The other thing you want a USPS account for is ordering shipping supplies. If you ship using USPS Priority Mail, the boxes and mailers are included in the shipping price. If you do a lot of shipping, the website will let you order 6 packs of 15 padded FREs. If you have a smart phone or iPad, you can install the USPS mobile app and it will allow you to order 100 padded FREs at a time. It is only 10 more, but if you know you will need them, might as well order them. You can order as few as 5 envelopes at a time. USPS retail locations typically do not stock the padded FREs, so you do need to plan ahead a bit if you want to use them. You do not have to be a business owner to order shipping supplies. So, if you just want a more economical way to ship something to your friend across the country, get yourself a 5 pack to have on hand. Sewing Mamas LLC is not able to provide legal advice and any legal decisions you make should be made after careful research and in consultation with your own attorney and tax adviser. Laws vary from state to state and the best course of action depends your specific circumstances. The information presented herein is provided for informational purposes only. Are you forming this business on your own? (That is okay!) Want your spouse listed as a member? Starting the business with a friend? It must be different from other LLCs in your state. The name must include LLC, or some other wording to indicate it is an LLC. Your state will have specific rules about this, they may allow LLC, “Limited Company” or some other variation. Your state may have other name requirements/restrictions. Make sure to review the filing instructions for more information specific to your state’s requirements. These are just basic requirements. For this example, our new business is called Perfect Pigweed LLC. Once you think you have “the name”, search to see if another business is already using a similar name. Google the name you want to use, check your favorite domain registrar (we use GoDaddy.com, this is our affiliate link) to see if a domain with that name is available, search Facebook, etsy, etc. Check the USPTO for registered trademarks. A careful search has not turned up other businesses with the Perfect Pigweed name. In fact, it appears no one is selling anything related to pigweed! We have hit upon an untapped market! 3) File Articles of Incorporation (Usually with your Secretary of State). This is usually a fairly short document that “creates” your company and includes the business name, operating address, owner(s) name(s) and the like. The cost of filing varies by state, and may also differ if you are filing online versus in person or by mail. In Minnesota, for example, it is less expensive to file by mail than it is online. As you plan your business, take note of your state’s turnaround times for filings. Some states process LLC filings very quickly, others take (many) weeks. 4) File An Operating Agreement. In many states this is not required. However, if you are not a single member LLC (ie, you are forming the company with another person), it is important to take this step, even if your state does not require it. An operating agreement clearly defines your company’s structure, the percentage of the business owned by each member, allocation of profits (and losses), and so on. Even if your other member is your spouse, putting all these things in writing is a good idea. 5) File An Assumed Name. If you will not be using your full business name in your business, you may need to file an assumed name, fictitious name or “doing business as”. (This is another thing that varies by state.) If you need to do this, it is best to take care of it right away. Perhaps we decide our business name will look much better on product tags and shop sign without the LLC on the end. (Oh, so much better!) We file the assumed name forms with the state to operate as Perfect Pigweed, but the official business registration and structure is still an LLC. 6) Get Necessary Licenses And Permits. These vary by location and by industry. Check this page on SBA.gov to see what you may need. In addition to federal and state licenses and permits, check with your local city clerk and county offices to see if they require a business license for your business or if there are restrictions on home based businesses. 7) Announce Your Business’ Formation In The Local Newspaper. The necessity of this varies by location as well. In addition to the legal announcement (if required), you may check to see if your local paper has a section where they announce or promote new businesses. Sometimes small local papers do this for no charge and it is a great way to get some free publicity in your local community. When you start thinking about going into business, you are likely to hear discussions of business types that include LLCs. What the heck is an LLC, anyway? An LLC is a “Limited Liability Company.” As a business structure, it is something of a hybrid. The LLC assigns liability for the organization’s debts and other obligations in a manner that resembles the responsibilities of a corporation’s shareholders and handles the income and loss as in a partnership or sole proprietorship. Let’s look at the last part of that first. We talked about sole proprietorships last week. In that post, I mentioned that the income (and expenses) from a sole proprietorship is reported on your personal income taxes, using a Schedule C form with the standard 1040 tax form. This is called a “pass-through” because the tax liability is passed through your personal taxes rather than requiring a completely separate filing for the business like you would have for a corporation. The federal government does not view the LLC as a separate tax entity, so the business itself is not taxed. This does not mean you don’t pay taxes on your business income! It simply means that the federal income tax liability is passed through to the LLC’s member(s) and paid with their personal income tax filing. In this discussion, our LLC is a single member LLC like the sole proprietorship. However, if your business has two members – you and your friend are going into business together, for example – you would file a form 1065 partnership tax return with your federal taxes. It is still a pass-through, just a different form since you are not a single member organization. This is just for federal taxes, states vary on how they handle LLCs, so check with your state’s income tax agency to find out how to file at the state level. If you do this before April, you will generally find the folks who work in these departments to be quite helpful because they have plenty of time to field just about any question you many have. And remember, they want you to do things correctly, so they really do want to help you! Here’s a link to help find the information you need for your state. Now to the liability part. Personal funds are comingled with business funds. You must keep your business funds separate from your personal funds. 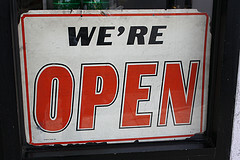 Open a business checking account, if you use PayPal, open a separate PayPal account, get a business credit card. Keep your business books completely separate from your personal accounting. And really, this makes sense regardless of your business type. Even if you are organizing your business as a sole proprietorship, you still want to know if you are making money, right? If you don’t know what was spent on groceries and what was spent on business supplies, how do you know if you are making a profit? If they are separate, you know this just by looking at your business accounts. Plus, you are more likely to be paying careful attention to how you are spending your business’ earnings. An owner personally guarantees a debt. If you take out a loan for your business and use your house as collateral, you have just taken personal responsibility for the company’s debts. The LLC fails to pay taxes or otherwise breaks the law. The owner(s) does not act in good faith. If you do something in the course of business to intentionally defraud your customers, the government, etc., you are personally liable for the resulting mess. This could be harm to people, property or even the LLC itself. The company lacks sufficient capitalization or insurance. In simplest terms, capitalization = money in. So, if your business has not maintained a reasonable cashflow to pay debts and liabilities, or if you do not carry sufficient insurance, you may be held personally responsible for the company’s debts. Make sure your business carries appropriate liability insurance as well as insurance for your business assets. Owners are not personally responsible for the company’s debts and liabilities (with the aforementioned caveats). Membership interests can be sold to raise capital. Ownership of the business can be transferred while the business continues to operate. With a sole proprietorship, all assets, licenses and other permits must be sold and transferred individually. However, with an LLC, the company is the entity that owns all those things rather than the individual owners(members). When an LLC is sold, business simply carries on since all accounts are in the name of the business. It is really quite tidy. Federal income tax filing is handled as a pass through, similar to a sole proprietorship or partnership, depending on the number of members in the company. There are set up fees for forming the business, filing documents with the state and sometimes annual fees depending on your state’s laws. As an example, in Minnesota, there is an initial fee to file the paperwork to form the LLC, but after that, there is not an annual renewal fee as long as the renewal is filed by the annual due date. Some states also have a minimum tax that LLCs must pay, even if the business does not make a profit. Be sure to check with your Secretary of State or State Department of Revenue to find out what the requirements will be for your business. While a sole proprietorship seems to create itself, the LLC is a more structured organization that does require papers to be filed with the government. Business accounts records must be kept completely separate from personal accounts. This just seems like a good practice for any serious business person, so I do not think it is a real disadvantage. Well, that is a lot of stuff. Our next Small Business Saturday post is going to dig in to getting the LLC set up. If you have questions about what is here or information to add, please leave a comment. Here’s a link to lawyers.com that will help you find a local law firm that can help you with business formation questions in your area. Today’s post is about getting started as a sole proprietor. First, I need to add the disclaimer that Sewing Mamas LLC is not able to provide legal advice and any legal decisions you make should be made after careful research and in consultation with your own attorney and tax adviser. Laws vary from state to state and the best course of action depends your specific circumstances. The information presented herein is provided for informational purposes only. There are several different types of business structures to choose from when you decide to get started. The most common is the sole proprietorship. A sole proprietorship is easy to form. If you are the only owner, your business is automatically a sole proprietorship if you start up and take no other action to formalize a business structure. Now, if you are thinking, “Wow, that sounds easy! I’ll do that!” Hang on a minute. Just because your business is a sole proprietorship does not mean your work in setting up the business is complete. You still need to get the necessary license and permits, which vary depending on your location and industry ~ Here is a link to the Small Business Administration’s licensing and permits information. If you want to operate under a name other than your own, you will need to file an assumed name, also called a fictitious name, or “doing business as” (DBA). Here is an example: Sue Smith wants to sell her hand sewn sea shells. If she does business under her name only, she does not need to register a DBA. However, if she wants to sell her products under the name Sue’s Shells, she would need to register that assumed name. Sue would want to register that name as one of the first things when setting up shop. This is the name she would use on official government forms, such as her application for an employer tax id, which she may want even if she does not have any employees. (What? Yes, really. More on that in a future post.) The DBA paperwork will also be needed to set up a business account at the bank for Sue’s Shells. However, this is another instance where you will need to check with your state, as not all states require registration of assumed names, though many do. Another thing to keep in mind is that in many states, filing for an assumed name does not protect the name from being used by others. In either situation, you may want to see if your state offers the option of filing for a trade name. Check with your state as well as the federal trademark registry to ensure your business name is unique. And for heaven’s sake, do a google search on the name you want to use first! Also, consider the initials of your business name. You do not want them to spell anything foul. Starting a sole proprietorship may seem like a very straightforward option, and in many ways, it is. Since you are the business, the income (and expenses) from that business is reported on your personal income taxes, using a Schedule C form with the standard 1040 tax form. You are also responsible for self-employment taxes. If the products you are selling are taxable, you must also register with your state to collect sales tax and then remit that tax to the state. This is separate from your income tax reporting. As with most things that seem simple, there is a downside to this option. Since you are the business, you are also personally responsible for the actions of the business. This unlimited liability means that you can be held personally responsible for ALL the debts and other business obligations, even those liabilities that are the result of actions of your employees. It is strongly recommended to buy a general liability insurance policy to help protect yourself financially. Hopefully you have a better idea of the basics of a sole proprietorship. Next Saturday, we will talk about Limited Liability Companies (LLC). They sound much more scary and formally structured than they are. An LLC can be a great option, even if you are the only member of the company.